On Sept. 5th Attorney General Jeff Sessions announced the Trump Administration would phase out the Deferred Action for Child Arrivals program in the next six months, leaving Congress to decide whether to continue the program. It currently protects 790,000 undocumented immigrants who came here as children from deportation. The decision caught the attention of many members in U of L’s Student Government Association, including President Vishnu Tirumala. 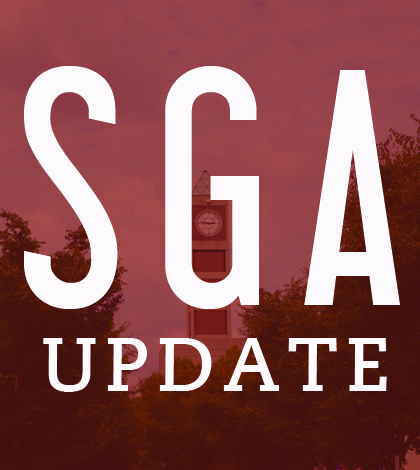 During the first senate meeting of the year, Tirumala stated his disapproval of the decision, explaining it affects many students within the university who contribute to the community. That sentiment continued in a statement SGA released on social media shortly after the meeting. 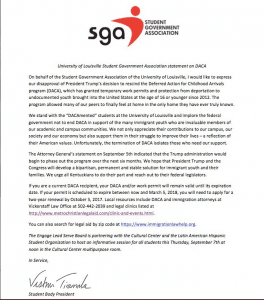 The statement also highlighted SGA’s hope the federal government can come to a bipartisan, permanent and stable solution. It provides information about deadlines and legal aid for those who affected. In the meantime, SGA will support those affected on campus. The Engage Lead Serve Board will hold an meeting about the program’s ending for students this Thursday in partnership with the Cultural Center, and the Latin American Hispanic Student Organization.